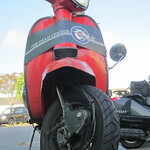 Top Dead Center Scooter Club Forums • View topic - Gauges? Hi, first, and thanks for coming to our little shindig. I want to start getting DATA to fine tune my Polini210 build. What gauges are you running and do you recommend starting with EGT or CHT if I can only afford one to start?